Ships tomorrow if you order in the next 24 hours 28 minutes. High levels of stress are almost unavoidable today. If left alone too long, they can have negative effects on your overall health. Stress can affect your eating habits, as well as your sleeping habits, and it can be difficult to find a healthy way to relax. 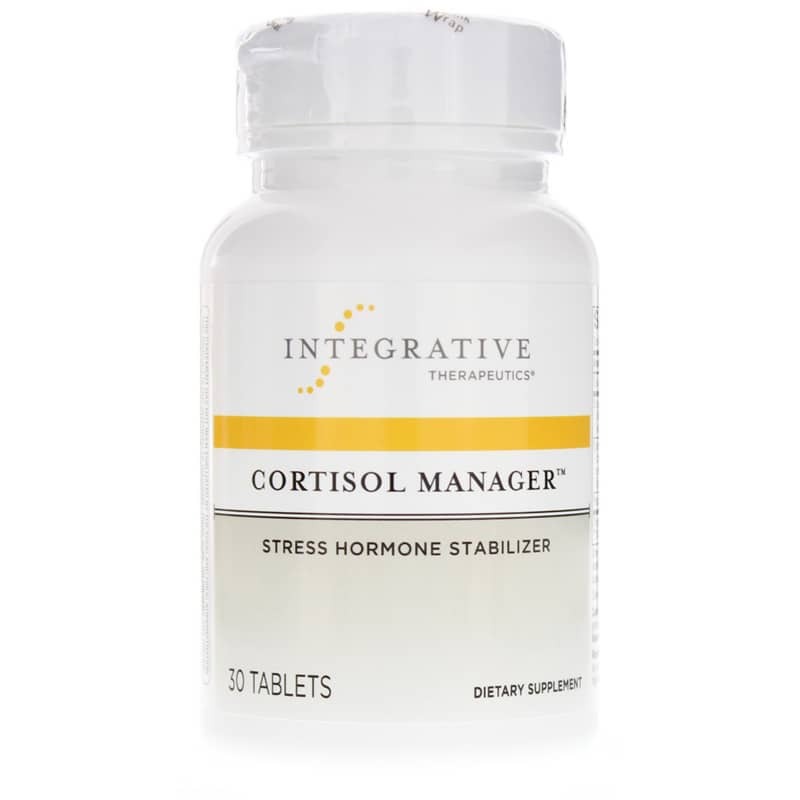 Cortisol Manager from Integrative Therapeutics is a natural cortisol supplement that delivers ingredients to help you relax, de-stress, and get a good night's sleep. 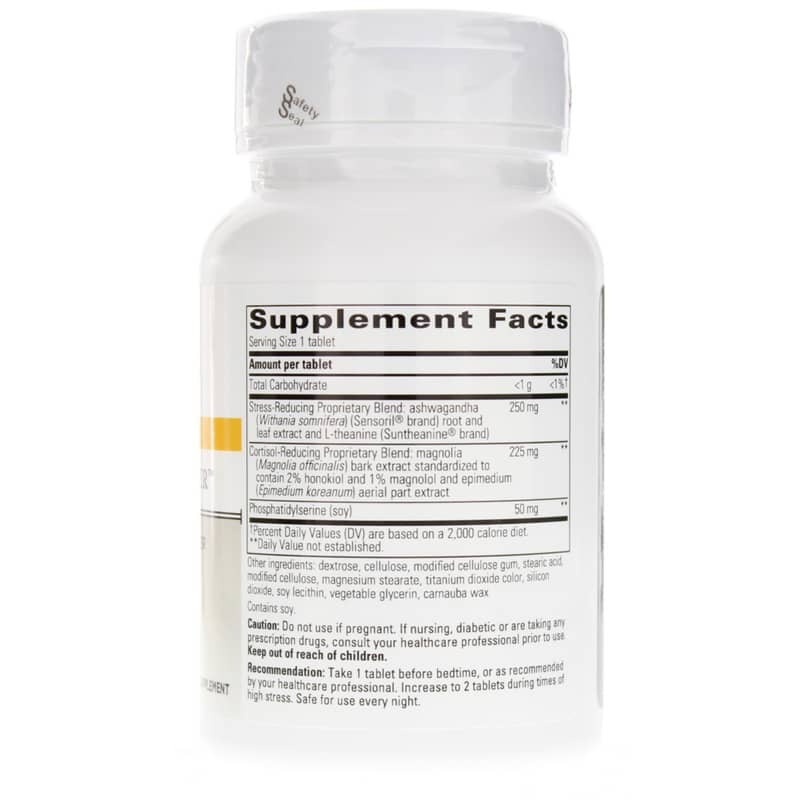 Don't suffer with high stress, little sleep, or morning grogginess. Start using Integrative Therapeutics Cortisol Manager today for reduced stress and deeper, more restful sleep. Order yours today and get back on the path to optimal overall health and wellness! ---Magnolia (Magnolia officinalis) bark extract standardized to contain 2% honokiol and 1% magnolol and epimedium (Epimedium koreanum) aerial part extract. Other Ingredients: dextrose, cellulose, modified cellulose gum, stearic acid, modified cellulose, magnesium stearate, titanium dioxide color, silicon dioxide, soy lecithin, vegetable glycerin, carnauba wax. Contains NO: sugar, salt, yeast, wheat, gluten, dairy products, artificial flavors, preservatives or ingredients of animal origin. NSF Certified. Adults: Take 1 tablet before bedtime or as recommended by a healthcare professional. Increase to 2 tablets during times of high stress. Do NOT use if you are pregnant. If you are nursing, diabetic or taking prescription drugs, please consult your healthcare practitioner before use. Keep out of the reach of children. I've used this product for a long time and was glad to see that it also comes in a 'value size' (90 tabs). some nights I can't quiet my mind, feel hyper and stressed. This has helped on those nights to get to sleep. No grogginess. This product seems to help me get a more restful sleep and I am not as tired in the morning. I am so glad I found this product which for me is on the other side of the world! I totally recommend it! Cortisol Manager is very helpful. I saw no negative effects. Immediately, I was able to cope with a very stressful time in which I had multiple very devastating events. I have had other things happen so that I have not been able to use Cortisol Manager daily but the first bottle did seem to help. Thank you. A good friend recommended this product after feeling like they were more rested after sleep. After several attempts on my own, I have to conclude that this product, unfortunately, does not work for me. This is a lesson that everyone's physiology is not the same. I'm glad this seems to work for most people, but for me... it has the opposite effect. Cortisol Manager fulfilled what the product description promises. Ive used this product for the past few years, and I've found it truly works, without the nasty side effects of other commercial "sleep-aids". Overall, a fine product! This pill has been recommended by my Traditional Chinese Medicine doctors. Cortisol Manager has really helped. I started using Cortisol Manager 30 minutes before bed and find that it helps me fall asleep easier and I am waking up less in the middle of the night between the hours of 1-4am. Cortisol Manager by Integrative Therapeutics is the MOST EFFECTIVE. I ran out of this taking two tablets a day within 15 days.... I would like 60 tablets for that price. My acupuncturist put me on Cortisol Manager at my first visit. Not sure if it's the acupuncture or this supplement. Regardless, I'm sticking with both! My acupuncturist prescribed Cortisol Manager to me. I've been using it for 6-months. I tend to sleep better, and feel more rested when I wake. 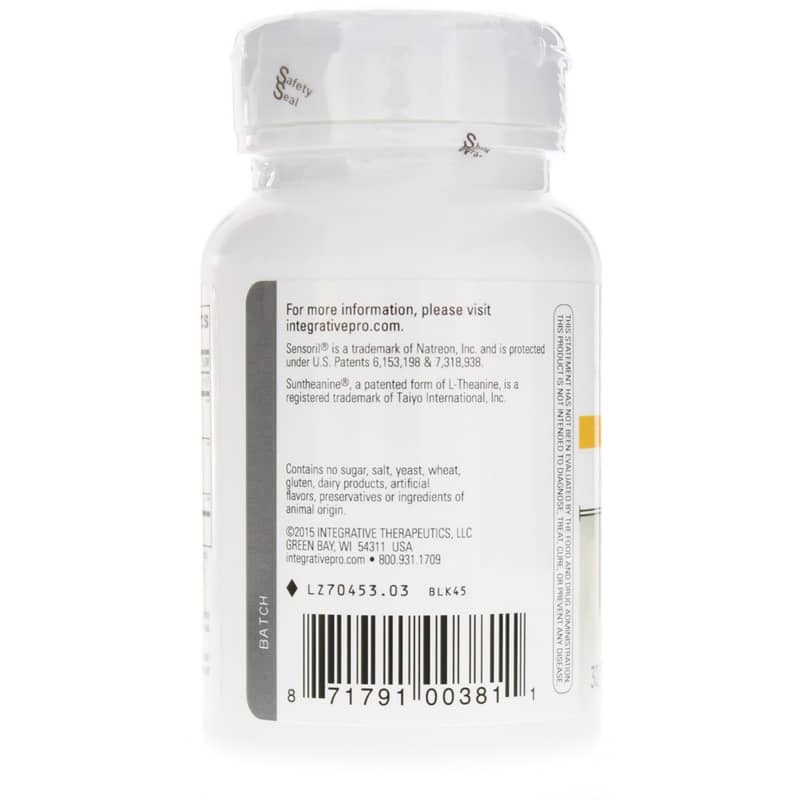 I found purchasing Cortisol Manager from Natural Healthy Concepts very user friendly. I have had only good results from this firm especially as I live in Sydney, Australia. Delivered right to my doorstep. Cortisol Manager seems to have re-aligned my system and is helping maintain better sleep patterns- not perfectly, but markedly improved. I recommend it. This product was for my daughter since her ND recommended it. It has seemed somewhat helpful for, but not as been as good for her as a Gaia brand. Read the reviews and bought into the hype. After an entire bottle I really felt no difference whatsoever. So I'm not sure what to make of these reviews. I wouldn't waste my money on another bottle. Due to high stress in my life I exhausted my cortisol levels and started having burning tongue...I take this everyday and it has relieved all the pain I was experiencing. This has really helped me. Increased blood pressure to dangerous zone. My Dr. recommended (takes it every night) & sold me a 90 count bottle. I cut all caffeine out of my diet and not only do I sleep better, I am not anxious and nervous. I have a very stressful job as a new teacher along with health problems and I am so relaxed since I've been taking the last 7 weeks. I take two at night through week and 1 on the weekends.